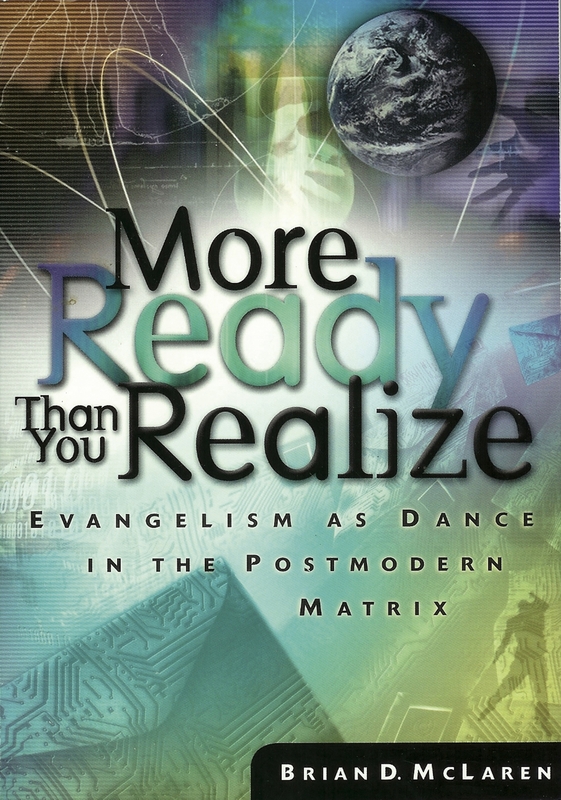 More Ready Than You Realize: Evangelism as Dance in the Postmodern Matrix, by Brian D. McLaren, Zondervan, 2002, 188 pp. I think Brian McLaren knows a lot about how to talk to people outside the church about God’s story. I want to learn how to do that too. So, when I came across his direct writings on the subject, I was in. This book is structured around a real evangelism conversation. The conversation took place over e-mail over the course of several years between McLaren and a woman simply identified as “Alice.” The book includes all of Alice’s inquiring e-mails to McLaren, along with some of his responses, an analysis of the questions behind her inquiry, and suggestions on how to handle similar questions. While it sounds a bit contrived, the book manages to avoid oversimplification and Alice’s voice keeps the dialogue fresh and real. The overall approach McLaren adopts and advocates is “spiritual friendship.” It’s not about getting doctrine right, teaching someone the correct path or having a confidence in the truth of Christian principles. It’s about listening, learning and befriending people who are outside of the faith but seeking and questioning and grappling with faith questions. McLaren engages questions with questions, speaks on Alice’s own terms in her own language, and dedicates himself to continuing the relationship over winning a convert. He writes, “Sometimes belonging must precede believing. … If people can belong long enough to observe how God is alive among us, if people can belong long enough to see authentic love among us, if they can belong long enough to see whatever good exists in our lives as individuals and as a community, they can come to believe.” (84-85) In his conversation with Alice, it is clear that she can participate in the Christian community with his church and in her friendship with him regardless of her belief. It is that openness that eventually opens her heart to the love of God. In so many Christian communities, belonging is contingent upon believing. This is not how Jesus operated, and not how we should operate. Thankfully, we in the United Church of Christ preach and try to practice welcome and hospitality first and foremost. One of the ideas I liked most, which I heard echoed in the Unbinding the Gospel series, is that the work of inviting people into relationship with Jesus and the church is not about getting them into heaven or into our pews. It is not about fulfilling their needs or the church’s. It is about engaging fellow workers in God’s field, training up more missionaries to aid the cause of God’s mission. We are inviting people to join us in making this world a better place by being God’s servants in it. Much of what is radical to conservative Christians (de-emphasizing doctrine, putting earth before heaven, engaging in friendship with non-believers) is the essential and normative terrain for progressive Christians like me. What I don’t know, and what McLaren has to offer, is how to continue to believe in evangelism and do the work of inviting people to Christ in this context. What’s radical for progressive Christians is believing and acting as though we have something valuable worth sharing. McLaren offers a wealth of insight on how to do that in ways that are relational, invitational and welcoming—not harsh, judging or bullying. Unbinding the Gospel: Real Life Evangelism, Church Leaders Study, by Martha Grace Reese, Chalice Press, 2007, 148 pp. 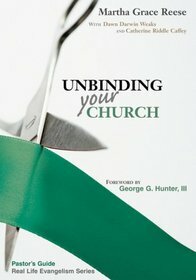 Unbinding Your Church: Pastor’s and Leaders’ Guide, by Martha Grace Reese with Dawn Darwin Weaks and Catherine Riddle Caffey, Chalice Press, 2008, 146 pp. 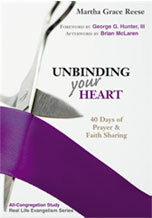 Unbinding Your Heart: 40 Days of Prayer and Faith Sharing, All Church-Study and Personal Prayer Journal, Chalice Press, 2008, 164 pp. This series of books, along with the fourth volume, Unbinding Your Soul, have been all the talk in the last few years among mainline Protestants looking to learn how to do evangelism that is authentic to our identity and faithful to our mission. I purchased the original (and skimmed it) over a year ago, but I am just beginning to work with congregational leaders to make use of this program at our church. As a first step, I read all three volumes, and gave two key leaders a copy of Unbinding the Gospel to preview as well. A key component of the process seems to be the prayer and exercises, which are done in groups. I have not yet undertaken that work or level of study with these books and their program. Martha Grace Reese’s work in these volumes is the outgrowth of the Mainline Evangelism Project, a research effort funded by the Lilly Foundation. That project identified adult baptisms as the chief sign of evangelism, since baptisms represent the entry of new Christians into the church (not just people moving around or changing churches). The study first identified the dire nature of the problem. If you eliminate churches in the South and churches that are predominately non-white, only one half of 1% of mainline churches are doing significant work reaching new people and bringing them into the faith. While they did identify some factors in this lack of evangelism, the study devoted most of its resources to studying those few churches that are successful evangelists. They chose for in-depth study the top 150 mainline churches in the country in numbers of adult baptisms. They identified what they were doing to be so successful, so other congregations might learn from their example. This book series is a program to help churches become better evangelists. The heart of the series, of the research and of the program, is that there is no great program that will save us. The path toward becoming better evangelists involves learning to pray and ignite our relationship with God, and having the courage to invite others to know the love of God. One of the participants sums it up like this: “You can’t give what you don’t got—your relationship with God must be hot!” (Unbinding Your Heart, 53) The Unbinding Series aims to generate some heat in our relationship with God through intentional prayer and small groups, so that we can then share that passion with others. This accords with my experience—if someone’s own faith is growing and deepening, they will tell others about it and want to share it with them. I found the books to be very insightful and stimulating for conversation, and I intend to follow through on the process for working on them with my congregation. I am excited about it, and believe it will be a great time of growing faith and prayer and evangelism in our church. However, I do want to share my struggle with these books. I feel like I have a personality-type conflict with the author. The books are packed with detail and instruction. Reese is clearly an expert in offering step-by-step instructions, planning for stages of effort and breaking down big jobs into small tasks. However, my brain doesn’t do such a good job of putting that back together. I am a big-picture thinker and learner, and I struggled in these books to get my head around the main ideas. As a leader, I want to have a clear vision of the whole picture, and I had a difficult time working that out in these books. This was especially true in Unbinding Your Church, which is really a workbook and instruction manual for using the Unbinding Series in your church. While she offers sermons, hymn choices, liturgical resources, exercises, job descriptions, meeting outlines, handouts and more, I yearned for a more simple overview that said, “Here’s what we hope to accomplish. Here is the experience we want to create. Here are the overall things we want people to encounter and remember.” I can follow step-by-step directions, but I would much rather have a whole map to orient myself in time and space. I often found myself feeling lost in details and no longer sure where I was going. If you are a detail person, you’ll love it. If you’re not, prepare yourself to wade on through—I think it’s well worth it. The Jesus of Suburbia: Have We Tamed the Son of God to Fit Our Lifestyle? by Mike Erre. W Publishing Group (Thomas Nelson), 2006, 202 pp. I picked up this book for a couple of dollars during a quick pass through a discounted bookstore. I did not spend too much time examining it, because I was so excited to see the topic, especially from an evangelical perspective. I had hoped that it would be an analysis packed with anecdotal, textual and theological evidence of the ways Christian subculture reduces Jesus from a life-changing social radical to a feel-good, do-good cheerleader, critique of the evangelical fusion of Christianity and suburban values, and insights into undoing this version of Christianity in favor of a more compelling and challenging vision. The book met some of those expectations and disappointed me in others, yet it was still a good read. Stylistically, it read more like a sermon or spiritual growth book than a cultural analysis. Think more John Ortberg and less Stephen Prothero. Once I got over what I thought it would be and started appreciating it for what it actually was, I thought it was a very good read. Theologically, it was definitely far more evangelical than I am, but my disagreements over his theologies of scripture and sexuality made my agreements with him about the nature of Jesus far more profound and striking. 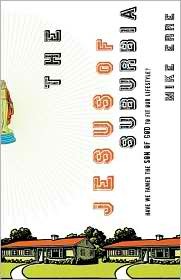 The Jesus of Suburbia was a fascinating point of connection for me with an evangelical perspective. Erre and I share many similar concerns over the face of Christianity in America today. While we also have fundamental disagreements on social issues and probably about the way in which the Bible is authoritative, we both understand that Jesus makes radical, life-changing demands upon his followers. We agree that Christ’s followers should always live with a degree of unease in our relationships with the world around us, particularly with anything that resembles the wealth or power of empire. However we understand the peculiarities of theology, all of Christianity is endangered if we accept a diminished, non-threatening, easy-going understanding of Jesus Christ. It’s been around awhile, but I just saw Sunshine Cleaning, starring Amy Adams as Rose Lorkowski and Emily Blunt as her sister Norah. In the movie, the two sisters start a business cleaning up after crime scenes, attempting to make better money than cleaning ordinary homes. Much to my surprise, I kept stumbling upon scenes that were strongly reminiscent of pastoral ministry. In the first one, captured in the video below, they show up to clean up after a death. All we know when they pull up to the home is that the death was a suicide, and the man was in his 70s. Rose instinctively moves to comfort the grieving widow. Notice the awkwardness in her face, her posture. She does not know what to say or to do, because there are no words that can be said and nothing she can do to change the grim situation. She just sits by her side and holds her hand so the bereaved woman is not alone. So much of the pastoral care we clergy offer looks just like this. “Would you like me to sit with you for awhile?” I have asked that question hundreds of times, in hospital rooms, funeral homes, living rooms and courtrooms. Like Rose Lorkowski, I sit awkwardly, silently and uncomfortably with the grieving one for awhile. Like Sunshine Cleaning, there is a service that we clergy perform, with funerals and information and planning. But much of what we offer is simply our presence, holding hands and lingering, unhurried. Later in the movie, Rose goes to a baby shower for one of her high school friends. Surrounded by married, successful friends from her high school days, she proudly begins to describe what she does for her business. It’s more than cleaning, she says: “We come into people’s lives when they have experienced something profound, sad… and… we help.” You can catch the line in the trailer below, starting at 2:02, although the visuals are not from that part of the film. For many people who are not churchgoers, clergy play a similar role. We show up when someone dies, or when their churchgoing parent is ill and hospitalized, and we help. Or at least we hope that we do. Sometimes we just sit and hold their hands, sometimes we offer information, sometimes we sing hymns or wash dishes or plan services. Hopefully, always, we pray. One other connection, from that same scene: Rose’s description of her life’s work is full of pride and excitement. However, her baby shower audience responds with an awkward pause and blank stares that belie a mix of horror and intrigue. The scene made me laugh out loud. I know those looks. Being a pastor, especially as a woman, frequently makes people uncomfortable in social settings, and sometimes people don’t know what to say about your work. Rose’s description of her work just serves to prove to her that she won’t ever be “one of the gang” again with her high school friends. There is an aspect of that in ministry as well, as we always carry our pastoral persona with us, like it or not. Sunshine Cleaning was an unlikely source of wisdom and imagery about pastoral ministry, but I take it wherever I find it. 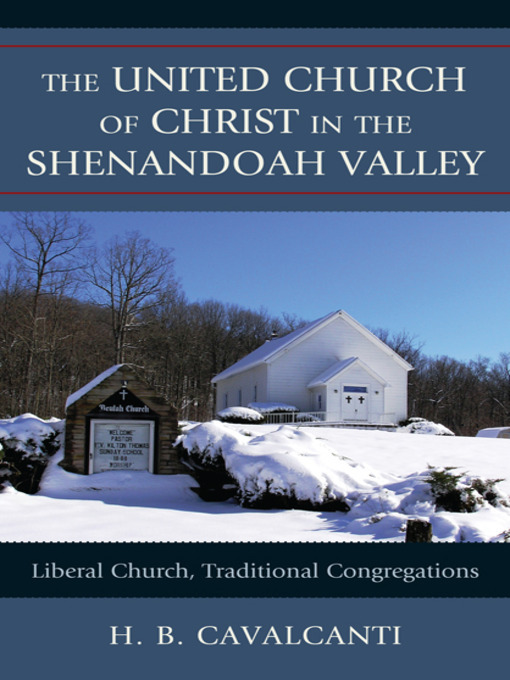 The United Church of Christ in the Shenandoah Valley: Liberal Church, Traditional Congregations by H. B. Cavalcanti, Lexington Books: 2010, 155 pp. It was a personal interest and an author’s generosity that led me to this book. I stumbled upon an article about it through my “Google Alerts” for the United Church of Christ. The article was in a local paper from the rural Shenandoah Valley of Virginia, where I went to college, interviewing an author from my alma mater (a public university) who had written a book about my denomination. It was in the Shenandoah Valley that I first discovered the UCC, and I attended several churches there, including one in particular that inspired me to seek membership and ordination in this denomination that I now deeply love. Compelled by the intersecting factors of my alma mater, my first UCC church and the Shenandoah Valley, I wrote to the author to express my excitement to read the book as soon as I could get it through a local seminary library. He generously sent me my very own copy. This book tries to answer that question by a concrete look at the churches of one association, and a close examination of its churches and their local practices and concerns. In my correspondence with Dr. Cavalcanti, I learned that he began this book as an outsider to the UCC. His background is in the Brazilian Baptist church (a mission of the Southern Baptist church), where he was ordained many years ago, before his academic career. His partner was raised in the UCC, but the author was not active in any church during the time he was researching and writing this book, except for attending all the Shenandoah Valley UCC churches for research. While his research opened the door for him to return to church through the UCC, what makes this book so interesting and compelling is his outsider’s perspective, the simple sociological viewpoint based on statistical measures, detailed interviews and rigorous observations. Many UCC clergy, theologians and seminary professors have pondered this same question, but I have never read a sociologist (in the context of a public university) examine it. This outsider status functions in two ways in the book. First, Cavalcanti writes notes and descriptions of the UCC and its culture that seem obvious to insiders like me. The observations he draws from worship experiences, church newsletters and descriptions of annual events like church picnics and Homecoming Sundays seem almost uninteresting to those of us who live those realities all the time. One whole chapter is “A Year in the Life of a Church,” and it could have been written about my church or any of hundreds of others in the UCC or many other mainline Protestant churches, especially smaller, historic ones. There were Easter egg hunts and Christmas pageants, hospitalizations and funerals, yard sales and Vacation Bible School, choir practices and annual business meetings. I did not need to read this book to know what goes on in the church throughout a year. There was no new insight or information there. And yet, that was one of the best parts of the book. There is something quite affirming and uniting about seeing those descriptions in print. It affirmed the basic, ordinary, unheralded work that the church does year in and year out to tend to the members of its community. By a close examination of one church, it described the reality of so many churches, and made me feel a sense of connection to all those other congregations out there in the UCC, to their pastors and leaders who are doing the same work we are doing, facing the same struggles and delighting in the same rewards. This book captures, for history, a window into my life and the life of so many other churchgoers and church leaders. It unites us as a denomination based on our shared experiences of ordinary church life. Second, the outsider’s perspective Cavalcanti offers creates a much more realistic, measured assessment of the original thesis question about the gap (real or perceived) between the local church and the national bodies. I currently serve in the Kentuckiana Association of the UCC, and my association is similar to the Shenandoah Association in many ways–historic churches with diverse histories, smaller and more rural settings, and a theological and political culture in our members that is much more conservative than our national representatives. I suspect it mirrors many local associations throughout the UCC. While my theology and politics align closely with our historic UCC commitments outlined above, I find myself standing in between the local church and the national church to act as interpreter. When insiders talk about the separation, we are caught up in the act of defending one side to the other, trying desperately to bridge the gap or push it closed. Cavalcanti’s outside perspective approaches the question without all our anxieties and defensiveness. On the other hand, those churches formed after the 1957 merger usually identify quite strongly with the priorities of the national church. I think that summarizes my experience of the relationship between the local and national churches in every association of which I’ve been a part. In the end, it is clear in reading this book—and in experiencing the lived reality of local UCC churches and associations—that the five historic commitments might not be what unites us, but we are united. Cavalcanti offers some concluding thoughts on the five characteristics that unite all the churches he studied in the Shenandoah Association, regardless of their political or theological orientation. I believe those same characteristics apply throughout the UCC. The UCC is evangelical: no matter how we understand him, Christ is always the center of our work. The UCC is confessional: worship is an act of reverence, to be treated with a sense of formality and sacredness, regardless of style, size or theology. The UCC is fiercely independent: each church stands proudly on its own two feet, claiming its own heritage and freedom, its own strengths and weaknesses. Across our theological and political divisions, from traditional historic churches to new and experimental ones, at the local level and the national setting, we are bound together by these shared practices and commitments. There is something that unites us, and Cavalcanti’s research helps explore and explain it. This book would be an excellent resource for any local pastor or leader interested in the dynamics of the UCC in a given association, or another “outsider” trying to grasp an image of this wild and diverse thing that is the UCC. Even more, Cavalcanti’s work should inform the work of all our judicatory staff at the Association, Conference and National settings of the church. There is much more to explore as we consider what unites us. It is a joy to read, and an insightful look at our local churches that both acknowledges their struggles and uplifts their ministries.